Reflecting on Pete Seeger, 1919-2014 by Michael Kornfeld, AcousticMusic Scene.com Pete Seeger, the inspirational American folk music icon, political activist, environmentalist and humanitarian, whose songs helped provide a musical backdrop for many of the historical movements of the past 50-plus years, died on Jan.. 27. He was 94 and had been preceded in death last year by his wife and soulmate of nearly 70 years, Toshi. So much has already been written about Pete Seeger that I’m not sure what more of particular value I can add. Within hours of his death, people – including many of my friends inside and outside of the folk music community — were posting heartfelt tributes to and remembrances of Pete on Facebook. Many were fellow musicians and songwriters who were inspired by him. Some knew him personally. Others were prompted, at least in part, by Pete to become involved in the movements for social justice, peace and protecting our environment and to incorporate their music in those movements. On the weekend before Pete’s passing, I attended and presented a workshop at the People’s Music Network Winter Gathering in New York City. PMN is an organization of people who are carrying on Pete’s legacy of writing and performing songs of freedom, struggle and social consciousness. 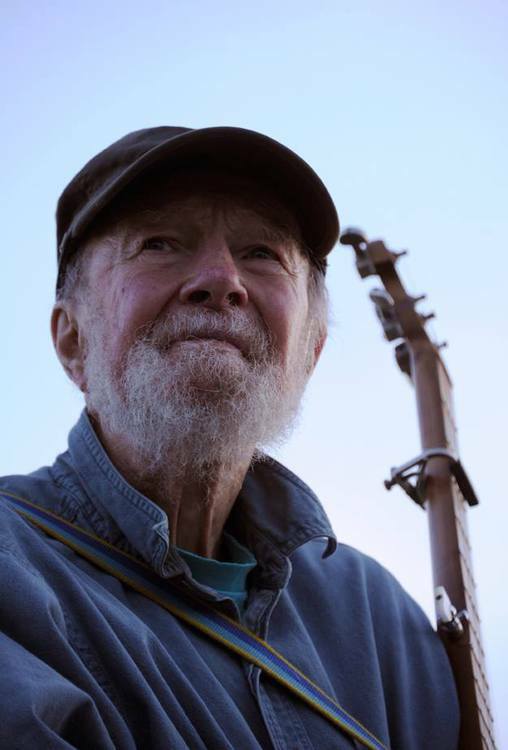 I saw Pete Seeger perform a number of times over the years –- first at Huntington High School on Long Island in the late 1970s, where he shared a bill with the late Harry Chapin, and, most recently, several years ago at Clearwater’s Great Hudson River Revival in Croton-on-Hudson, New York that he helped to launch. Although I spoke with him on a couple of occasions, I didn’t know Pete Seeger personally. Yet, I, too, found him to be inspiring. I have been participating in song circles and singing along at folk concerts and festivals for as long as I can remember. While Pete wasn’t directly responsible for my political activism, which started at a very young age, it was always nice to see him participating in some of the rallies that I attended and engaged in the struggles for peace and social justice, and the efforts to educate folks about and protect the Hudson River, all of our waterways, and our planet. Like Pete Seeger, I also have never been one to shy away from speaking out on controversial issues. Unlike him, I was never brought before the House Un-American Activities Committee, convicted of contempt of Congress, and blacklisted for exercising my freedom of speech and of association. Heck, I wasn’t even born when that happened. As Bruce Springsteen once said, Pete Seeger lived a life that was “a testament to the power of song and culture to nudge history along.” He was the essence of humanity, a man who dedicated much of his life to seeking to help others, to lift us up through song and his indomitable spirit, to bettering the human condition and that of our country and our planet. Pete Seeger may be gone now, but I hope that his legacy, his songs and his challenge to us to employ the power of song to help change the world will live on for generations to come.